July 20 – The Bodacious sweet corn was fantastic. We got 400 ears or more of very good quality corn. Everything is nearing maturity: melons, squash, tomatoes, blackberries. June 18 – The corn began silking on my birthday – 12th. Half of it looks great. Other half is where an old cedar stood 2 years ago and the soil needs more amending. Most onions are up. Tomatoes are taking to their spiral trellis system. Adding string has secured the stakes from moving too much in the wind (which could damage the stem). 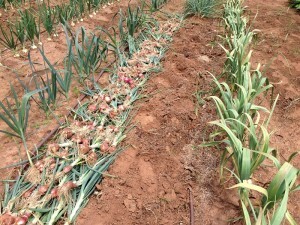 June 4 – have harvested the best looking red shallots. Each plant had 5-8 nice bulbs. The garlic came up today. Nice heavy bulbs with big cloves. Blackberries for adult one year canes (they are much taller). These produce next year’s berries. Trellis all peppers with horizontal mesh. Train Tomatoes and use twine. Beans – late in June. Composting – we need another new pile. All we had is in the ground or is mulch on top of tomatoes and peppers. 5/18 – Very little rain this month (maybe only 1 inch in last 30 days). Xander and I harvested 1 gallon of strawberries yesterday! Many more in the beds. Okra – planted next to peppers for shade in summer heat. Give side dressing to blackberries. 4/24 – Replanted ‘hardy’ crops. They froze to death in late frost (26 F). Corn planted yesterday. It seems too windy to transplant the peppers and tomatoes. But it is getting late too. 4/8 – Most early plantings (hardy crops) are planted and the seed is sprouting (kale, collards, turnip, beets). Tomatoes – stake and twine. 1/2 steel posts and wooden stakes. Tomatoes in small garden – hog panels shaped as teepee. Turn Compost and make new pile. 3/23 – starting late with this year’s diary/journal. Last year we were busy building the seed starting enclosure with shelves and lighting. This year we have less prep work. scallions – these bulbs are hard to find locally? Hmmm wonder why? Bed preparation – clear and till early beds. 100′ x 10′ light insect mesh for hoop houses. Turn other piles into one. Yeah! time to do Bayesian Networks too! Scallions…easly started from seed. 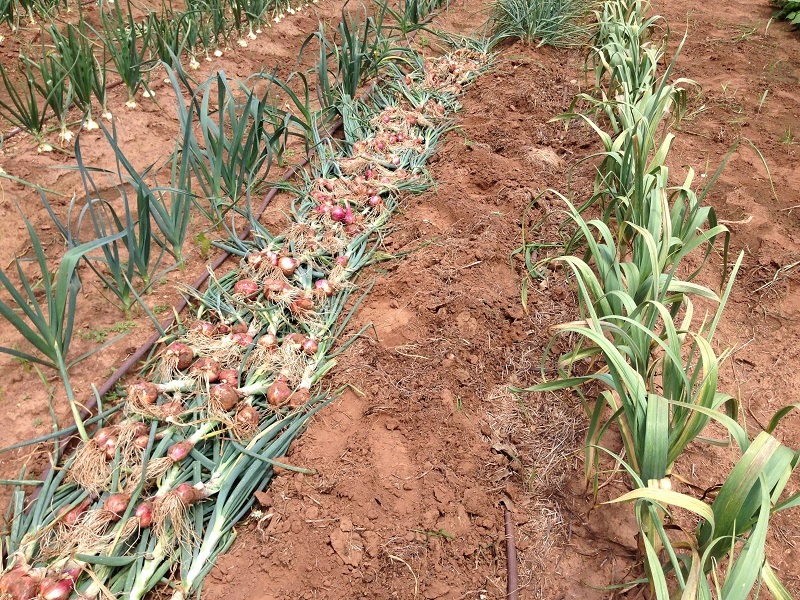 Easier than other onions and dont have to be the year before, because you are not trying for bulb production. I just don’t know what varieties to suggest for Okla.